The vineyard of Château de Corton André, in the tiny town of Aloxe-Corton on the Route des Vins north of Beaune. This is the third of three posts about our brief but memorable stay in the Burgundy region. If you haven't already, check out post 1 about the cheese cart and post two about triple-cream cheeses. 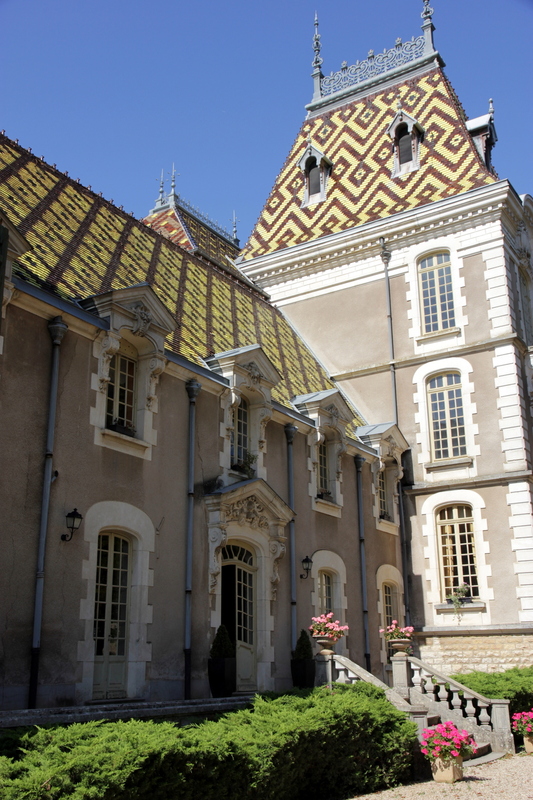 A few days in Beaune was a great introduction to the Burgundy region. Burgundy, like most places in France, is picturesque. It has rolling hills, farms, and vineyards, charming, walkable towns, buildings with their characteristic tiled roofs, and restaurants and cafés a plenty. The food and wine are outstanding and reflect the rich terroir, that unique combination of environment, culture, and history that gives each region its uniqueness. Mme Fromage and I really enjoyed it. The Château Corton André with its glazed tile roof. The kids, on the other hand, remember the trip a little differently. For them, the standouts were the rental car (a Fiat 500L) and the hotel bed they shared. We spent the last morning of our visit driving the Route des Vins and farm roads north up to Nuits St Georges. Lunch was approaching and we wanted to get back to Paris before the evening rush. A two-hour meal thus wasn’t in the cards, especially as we’d eaten full meals in nice restaurants for the past several days. So we went in esearch for something a little lighter both in terms of quantity and cost. Right outside of Nuits St Georges, next to the entrance to the autoroute, we found a Carrefour supermarket where we purchased smoked salmon, a pre-made tuna salad with herbs and capers, and some sliced turkey. We bought cheese, too, of course. The Soumaintrain came from Fromagerie Gaugry, home of the famous master fromager Raymond Gaugry from Dijon who invented Ami du Chambertin. We also bought a wedge of Morbier, a semi-soft cow’s cheese from the Franche-Comté region with its distinct vegetable ash stripe in the middle. Next door there was a bakery, where we bought a baguette and an apricot tart for dessert. Soumaintrain and Morbier. It's supermarket cheese, but it was still pretty good. Fifteen minutes after we got on the highway we found a rest stop. We parked the car and walked to a picnic table off a little path in the woods, where we laid our provisions out on the table and ate lunch in the sun. The kids remember different things than we do about our trip to Beaune, but we all have remarkably similar memories about our “picnic on the side of the road”.